It is interesting to note that when a porcupine feels threatened, it tenses up and attacks predators with its tail, embedding quills into their skin. It merely creates the illusion that quills are shot out, when loose quills fall out after the attack. These creatures are often bought as pets with very unfortunate consequences to other animals occupying the household. 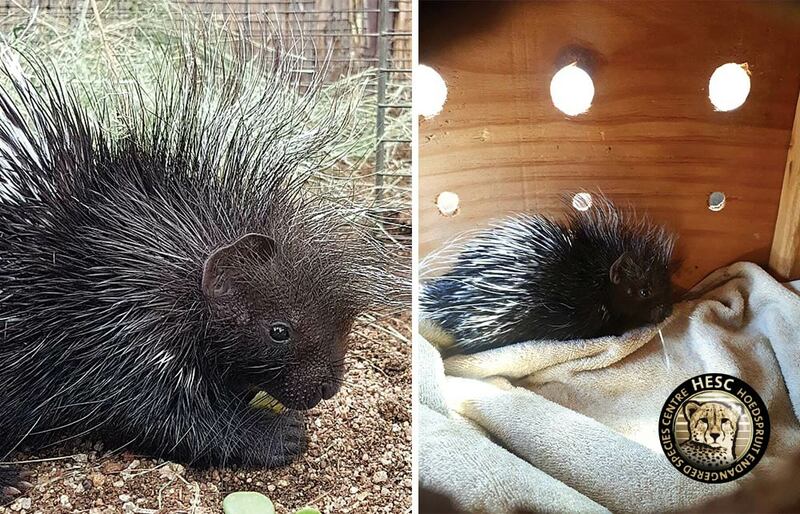 Poor Elvis the porcupine was rescued by people and taken to the vet. It is unclear what happened to him before the rescue but, they dubbed him Elvis. The HESC team plans to raise him and set him free once he is big and strong enough. Porcupines grow accustomed fend for themselves and leave their mother at around 6 months after they are born. Elvis will be closely monitored: this timeline will be used only as a guide. He will be checked regularly as his release is dependent on him being able to fend for himself. Elvis is currently doing very well: he receives kitty milk twice a day, which he drinks out of a bowl. He also receives fruit and vegetables three times per day and that is a big treat. His favourite vegetable is Sweet Potato. Baby Elvis has been moved into Small Pen in the Bokkie Boks Enclosure (the enclosure on the way down to the Cheetah Deli) until he gets bigger. He will then be moved to the big enclosure until he is fully grown and only then will the HESC team plan to release him back into the wild.